In Western industrialized countries, it is hard to imagine unpackaged goods with the exception of very few sectors. The amount of packaging used for protection, transport or presentation of the products can be enormous. Flexible packaging offers impressive options for ever more demanding consumer requirements. As a result, they are replacing rigid packaging in many segments. The definition of "flexible packaging" is by no means set in stone. This study takes the definition to encompass a much broader range of products than other studies with a similar title. It analyzes not only packaging for consumer goods sold to end customers in retail stores, but also secondary and tertiary packaging (e.g. shrink and stretch films) that are used for storage and transport of goods. Also included as flexible packaging in this study are heavy duty and industrial packaging like sacks or flexible intermediate bulk containers (FIBC). Other product groups covered in this publication are carrier bags (both made from films and woven) and labels. Included are packaging products made from plastics, paper, and aluminum. 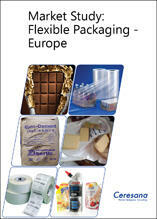 Analysts at Ceresana expect the European market for flexible packaging, i.e. all types of packaging and materials taken together, to reach a market volume of about 19.2 million tonnes in 2021. The packaging industry is continuously reacting to changes in consumer requirements. A decisive current trend on the European market is an increasing demand for convenience products on the part of consumers. Lack of time and a desire for convenience and easy and practical use as well as attractive and innovative products are the mainsprings. Stand-up pouches are an important growth segment on the market for flexible packaging. This triumphant rise of stand-up pouches is not a coincidence: The use of low-weight composite films allows for a further reduction of weight compared to metal tins and rigid plastic containers. Resource consumption and transport costs fall simultaneously. Modern filling techniques in combination with sterilizable bags guarantee an ever increasing quality of products and rising filling speed. Disposable sachets also offer advantages to many consumers. In past years, an ongoing increase of time spent at work resulted in an increased to-go consumption and a desire to save time when preparing meals and drinks at home. Ready-dosed medicaments are a growth market for these single-portion packs, considering the aging population in many European countries. The choice of materials and material layers is determined by the specific properties and demand that a packaging needs to fulfil when used for a specific good. In many segments, flexible packaging made from biaxially oriented polypropylene (BOPP) or PET (BOPET) has become much more important in the past. Especially in Western Europe the market for BOPP films performed weakly in recent years. But demand is projected to recover in the future. Thanks to its positive properties, consumption of flexible BOPET packaging will continue its dynamic development, especially across large areas in Eastern Europe. Since the average age in many European countries keeps rising, dynamics on the market for the packaging of pharmaceutical products will pick up speed in upcoming years. The sector flexible packaging will also profit from an increasing move towards one-portion packs. Following the decline in 2008 and 2009, the segment heavy duty and transport packaging is recovering. The market for transport packaging can capitalize on the increasing volume of products traded via the internet. Chapter 1 lists demand for flexible packaging (in tonnes) in Europe as a whole and 23 individual countries, split by the packaging types "Packaging films (plastics)", "Bags & sacks (plastics)", "Shrink & stretch films (plastics)", "Labels (paper)", "Bags & sacks (paper)", "Other packaging (paper)", and "Aluminum packaging". It also depicts demand in these countries split by the materials polyethylene (PE), polypropylene (PP), polyethylene terephthalate (PET), polyvinyl chloride (PVC), other plastics, paper, and aluminum. Analysis for the eight largest markets (Germany, France, the United Kingdom, Italy, Poland, Russia, Spain, Turkey) and the aggregate of all remaining countries is additionally split by the applications "Food" (incl. beverages)", "Consumer non-food", "Heavy duty & transport", and "Carrier bags". Chapter 2 offers a substantial analysis of various types of flexible packaging: Data on demand development for the packaging types "Packaging films (plastics)", "Bags & sacks (plastics)"; "Shrink & stretch films (plastics)", "Labels (paper)", "Bags & sacks (paper)", and "Other packaging (paper)", each split by 23 national European markets. In chapter 3 demand for the packaging materials polyethylene (PE), polypropylene (PP), polyethylene terephthalate (PET), polyvinyl chloride (PVC), other plastics, paper, and aluminum is analyzed, split by 23 European countries. Chapter 4 examines the application areas for flexible packaging: Data on demand development in the segments "Food (incl. beverages)", "Consumer non-food", "Heavy duty & transport" and "Carrier bags", split by the eight largest market and the aggregate of the "rest of Europe". Chapter 5 provides profiles of the largest manufacturers of flexible packaging, clearly arranged according to contact details, turnover, profit, product range, production sites, profile summary, products, and applications. Extensive profiles are provided for 80 producers, including alesco GmbH & Co, KG; Ampac Flexibles; Bemis Europe Flexible Packaging; Graphic Packaging Holding Company; Leipa Georg Leinfelder GmbH; Mitsubishi Polyester Film GmbH; Papier-Mettler; Polifilm GmbH; RKW SE; Sappi Europe; Südpack Verpackungen GmbH & Co, KG; Taghleef Industries LLC, and Treofan Group.